and they look at you blankly, causing you to think to yourself, “how is it possible that they (we’ve) completely overlooked the person who created the piece they’ve been playing? !” Alternatively, can your students explain what a sonata is or why, in the first movement of a concerto, the opening seems to always come back near the end? We all strive to help our students develop into well-rounded musicians but, sometimes, in the blur of working on the basics of flute playing, preparing for juries, recitals, and competitions, etc. we overlook making the connections between the music they are playing, the person who created it, and the time and place in which it was created. We know it is important to ensure that our students understand how their repertoire fits into the context of music history and we want to ensure that they have a working knowledge of the composers who wrote the works they’re playing, particularly as many composers of our repertoire aren’t covered in the general music history curriculum. Over the years, I’ve developed a method I find effective. I require my college students (and some advanced high school students) to complete research and listening sheets. Students complete these over a period of weeks/months as we study a piece of literature. The research elements of this assignment result in students learning about the composer, his or her place in history (including elements of performance practice/style), the significance of the particular work in the flute repertoire, and developing a basic understanding of the form of the piece. The research sheet also provides lots of mini-opportunities to develop skills in evaluating quality sources. The listening component contributes to the development of critical listening skills and exposes students to performances by significant flutists as well as providing opportunities to evaluate performances by those flutists and other flutist recordings available on sites such as YouTube. The research sheet ensures that students know basic information about the composer, consider the importance of this work (or type of work) in the flute repertoire, put thought into how the work conforms or differs from its genre, and consider the way in which the composer has organized his or her musical ideas. This information helps the student develop an informed interpretation and understanding of the work. I require that students include both the musical style period and any sub-styles as well as the composer’s nationality/ethnicity as this information can be very useful in understanding the style and/or content of the work. For example, in the Baroque era, the French, Italians, and Germans all took different approaches to ornamentation. Knowing the composer’s nationality (and/or where they lived and worked) helps the student decide if adding ornamentation is appropriate (as is often necessary for Italian Baroque music) or if the ornamentation is likely already included (as is common among French composers of the Baroque era.) Beginning in the late 19th century with the significance of nationalism, knowledge of the composer’s ethnicity might help explain the use of a particular tonality, meter, form, or other compositional technique. Students also begin to see parallels between different works in the same genre. For example, as they work on multiple French Conservatoire pieces they can observe the standard format and elements (slow/fast, usually a mix of simple and compound time signatures, etc.) If they had not been required to consciously consider the form of the pieces, they might not make the connections. The listening sheet ensures that students are listening to recordings of their solo and chamber repertoire and provides a structured forum for me to help them develop critical listening skills and the ability to evaluate a performance. For my college students, I ask that they listen to at least three different recordings of any solo or chamber works they study with me. When we are studying a piece from the Baroque period, I require that one recording must be on a period instrument, one on a modern instrument, and the third is their choice. I provide a large list of recommended flute players and encourage students to choose a variety of flutists over the course of a school year, rather than consistently relying on one or two favorites. My institution has a very limited recording library and I know that students prefer ease of access, so I encourage them to use a variety of sources including Naxos streaming and free web-based services like YouTube, SoundCloud, and Vimeo. Works for which there are few, if any, commercial recordings can provide a wonderful opportunity for students to evaluate sources of dubious quality and develop the ability to make informed and constructive critiques of those sources. This semester, my freshman music education major and I are doing precisely this. There are no commercially available recordings of one of the works she is learning, so she is to listen to the two recordings available on YouTube and complete the listening sheet. It has been a very informative exercise, which provided an excellent opportunity for us to discuss the impact recording quality can make on our enjoyment of a performance as well as the choice by one of the flutists to play the piece with a different accompanying instrument. Further benefits to these critical listening exercises include providing examples for the student to aspire to and facilitating the development of a framework for self-evaluation of their own practice and performance recordings. While at first glance this project may seem a bit overwhelming, in practice, it doesn’t require a huge commitment in terms of time over the course of a semester. I believe that the time investment in negligible in comparison to the value to the student. 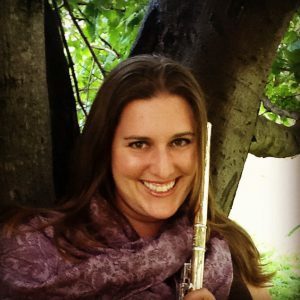 Dr. Ashley Shank is the instructor of flute and chamber music at Lycoming College and adjunct professor of music education and director of the music preparatory program at Susquehanna University. An active freelancer in North-Central Pennsylvania, she is also a member of the Keystone Wind Ensemble and co-principal flute of the International Fellowship of Conductors, Composers, and Collaborators (IFC3). Ashley is a dedicated advocate for new music and music by composers from Russia and the former Soviet Republics. She is founding board member and Grants and Finance chair of the Flute New Music Consortium, an organization with the shared mission of commissioning and supporting new music for the flute. Dr. Shank earned a Doctor of Musical Arts degree in flute performance and literature with a cognate in music theory from the University of Illinois at Urbana-Champaign, Master of Music degrees in flute performance and music history and literature from the University of Akron, and a Bachelor of Science degree in music education from Indiana University of Pennsylvania. Former teachers include Jonathan Keeble, George Pope, Alberto Almarza, Therese Wacker, Brian Luce, Carl Adams, and Jennifer Dell.